Chronic Paroxysmal Hemicrania is a severe headache that occurs on one side of the face and effects mainly the area around the eye. The attacks last from 2-45 minutes and occur at least 5 times in a day. The attacks are usually associated with redness of the eyes, tearing, nasal congestion and eyelid edema. There is a female preponderance in patients with chronic paroxysmal hemicrania. The median age of onset is 34 years, but attacks may begin at a younger or older age. Between attacks, the neurological exam of the patient should be normal. Any neurological abnormality that is present in the absence of these attacks should be an indication for further investigation for a secondary cause of headache such as tumors, aneurysms or demyelinating disease. 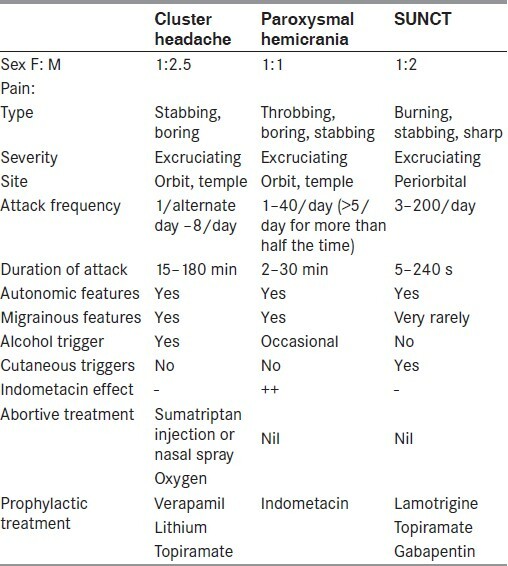 The headache is responsive to Indomethacin. Failure to respond to Indomethacin puts the diagnosis of chronic paroxysmal hemicrania into doubt. Patients with this problem may begin with a non-chronic form of the headache. Some patients remain in the non-chronic stage, but many progress to the chronic form. There is usually no precipitating event that starts these symptoms although they may sometimes be associated with trauma to the head and neck. There is also no familial or genetic tendency in patients who have chronic paroxysmal hemicrania. Patients with chronic paroxysmal hemicrania must be differentiated with patients that have migraine disorder, cluster headache, SUNCT syndrome and LASH syndrome. These syndromes will be discussed in another section. MRI scans may be useful to exclude intracranial pathology. The diagnosis of glaucoma must also be entertained. Failure to diagnose glaucoma may result in permanent visual impairment. Angiography may be useful to look for intracranial aneurysms. In the end, chronic paroxysmal hemicrania is a diagnosis that is obtained by careful history and physical exam, as well as the response to indomethacin.